ICN2 researchers led by ICREA Prof. Jordi Arbiol, in collaboration with the IREC and ICIQ, have produced a material for use in photoelectrochemical water splitting that is not only cheaper than existing alternatives, but increases both the efficiency and output of the process. Based on the integration of several materials into a multilayer nanowire structure, the research was featured on the cover of this month's Energy & Environmental Science. 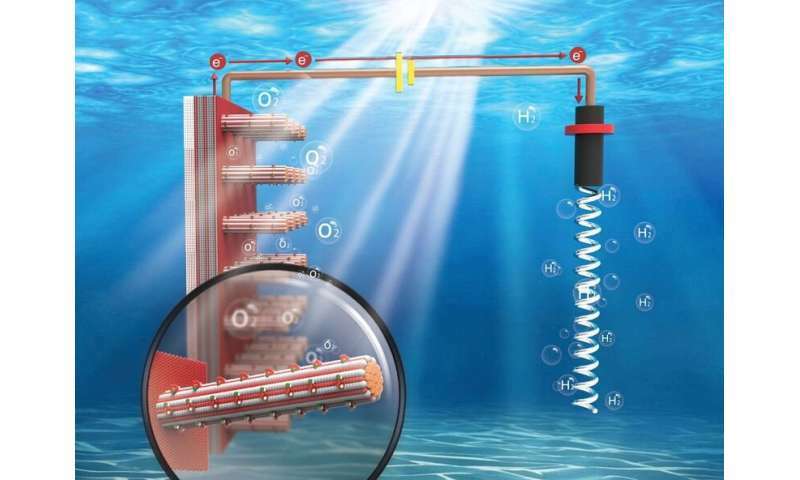 Photoelectrochemical (PEC) water splitting is a process whereby sunlight is harnessed in combination with specialised semiconductor materials to induce electrolysis and separate the hydrogen from the water molecule. With global climate change driving the need for efficient sources of sustainable energy, it is a topic that has received much attention in recent years. ICN2 researchers in collaboration with the Catalonia Institute for Energy Research (IREC) and the Institute of Chemical Research of Catalonia (ICIQ) have optimised the properties of the semiconductor material for more efficient and productive solar-to-fuel conversion. Specifically, the semiconductor material is needed to absorb the solar energy and act as an electrode in the water splitting process. Hematite, a common semiconductor with a narrow bandgap ideally suited to absorbing the solar spectrum, is a possible photoanode. As an iron oxide (α-Fe2O3), hematite is among the most abundant minerals on Earth's surface and so is considerably cheaper than the gold and platinum typically used. However, issues relating to the flow of electric charge (namely, poor charge transport, surface charge recombination and slow charge transfer kinetics) have limited its practical application in PEC water splitting. To overcome these limitations, previous studies have focused on the development of hematite composites, structures which incorporate a second material that lends compensatory or augmentative properties to the hematite base. A number of materials have been studied in binary formulations with the hematite. Jordi Arbiol and his team have integrated a full four materials into a multilayer nanostructure and systematically studied the PEC performance of the resulting photoanode, also shedding light on the underlying chemical mechanisms. In the paper, first author PengYi Tang describes in detail the fabrication processes by which the four earth-abundant materials are brought together in a novel nanowire-based core/shell hematite heterostructure complete with "nanodots" (see illustration). A study of the charge transfer kinetics at the electrode interfaces also highlights the role of the surface state density/donor density ratio in determining the material's charge transfer efficiency for PEC water splitting. The designed quaternary composite photoanodes outperform existing state-of-the-art structures, while the work as a whole presents a more complete picture of the behaviour of these integrated photoanodes.